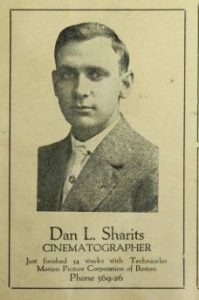 Dan L. Sharits was an enterprising and ambitious manager of the Star theater (1911-1918) in Medford, Oregon, who leveraged his movie theater experience into a career making pictures in Hollywood. He recounts his Horatio Alger story in a 1916 piece in Motography, “From Usher to Exhibitor.” In 1906, he started as a humble usher in Memphis, Tennessee, but in no time he became “chief operator.” After touring the country as a vaudeville performer, he landed in southern Oregon to manage the Star. 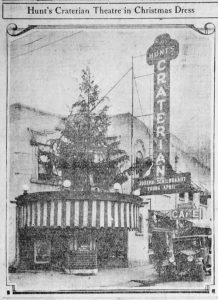 The Star had plenty of competition during Medford’s boom time in the 1910s, so Sharits used several inventive strategies for attracting audiences, including attaching an electric sign on the top of his car and playing orchestra bells while driving around town. 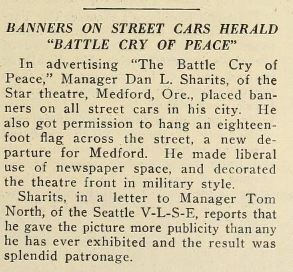 The “Live Wire Exhibitors” column in Motion Picture News carried the following item about his novel gimmick to promote The Battle Cry of Peace in 1916 by draping all of the city’s streetcars with banners, along with a giant flag across Main Street. Sharits brought the formula to Eugene in the summer of 1915, where it was pitched as an advertising film featuring prominent local citizens. 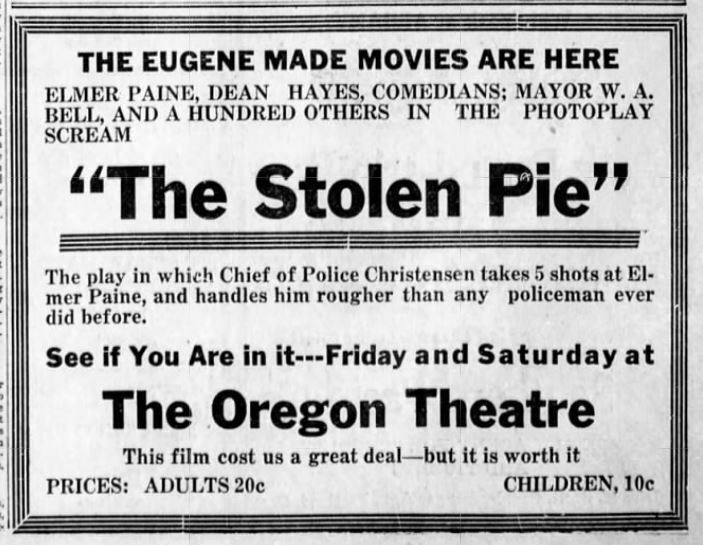 “The Stolen Pie” screened at the Oregon theatre. 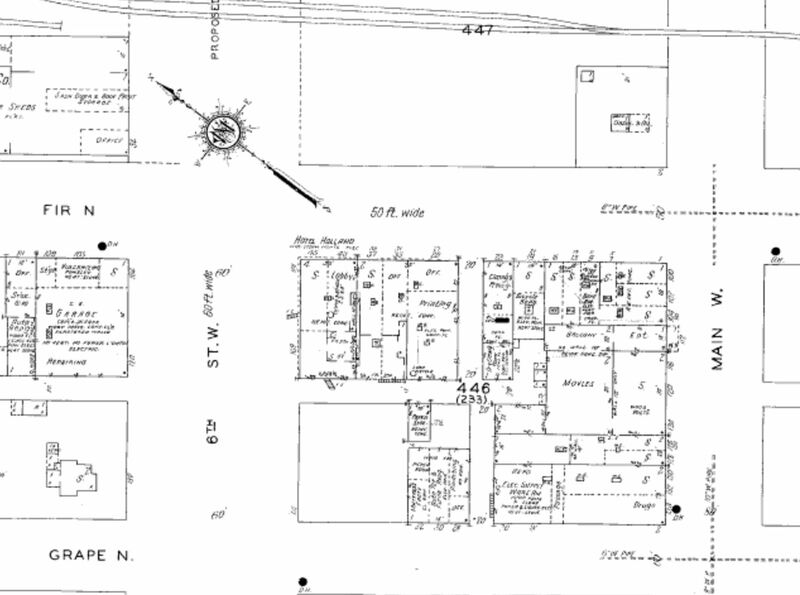 The next summer in 1916 Sharits replicated his success in Klamath Falls and Medford. He continued his program of self-promotion with an ad for himself in Camera! magazine. By 1922 he was working as a cameraman in Hollywood, and continued as a film editor on several films in the 1920s. Dorothy Jaquish was a movie theater prodigy, as this article in the exhibitors’ trade journal Motion Picture World explains. When she was still a teenager, she took over running the Dreamland Theatre in remote Ontario, Oregon, after her father died in 1918. The Dreamland opened in the small (pop. 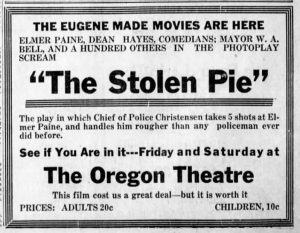 1,248 in 1910) eastern Oregon town of Ontario in September 1912, and was the sole movie theater in town through the 1910s. 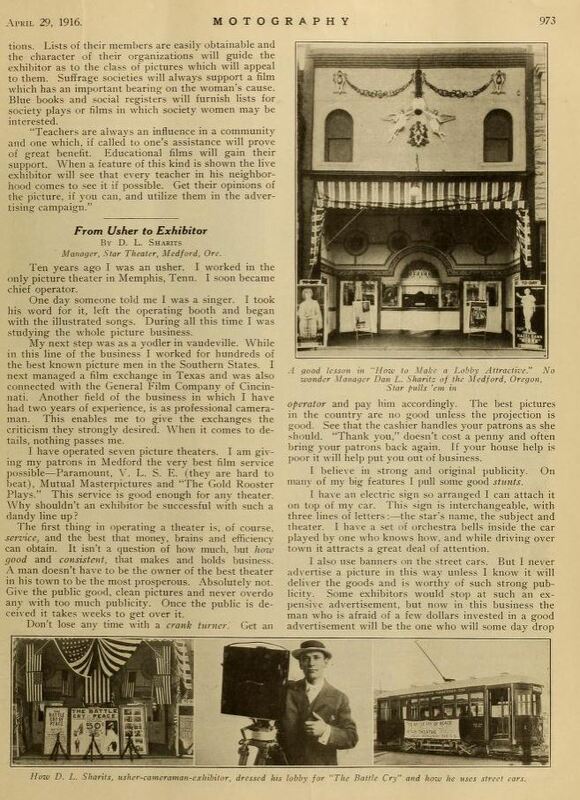 Under Dorothy’s management the theater continued operating even when the rival Majestic Theatre opened in 1920. A full page of ads for both theaters in the Ontario Argus newspaper show the robust level of competition for audiences. 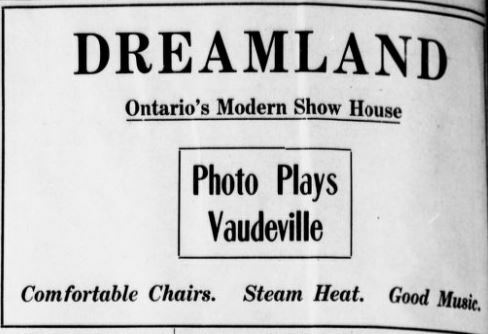 Ads for the Dreamland continued to run in the local paper through 1922 (online coverage of the paper ends in 1922), so it’s unclear how long the theater stayed open, and its fate requires more in-depth research. Oregon had several theaters run by women during the silent era, including the Dreamland, Electric, and Folly in Eugene, the Elite in La Grande, and the Sparks in Klamath Falls, but the full extent of women’s participation in theaters in Oregon and elsewhere in the United States hasn’t been fully documented, as the Motion Picture World article suggests. In my research so far for the Oregon Theater Project, I have run into several struggles and triumphs. 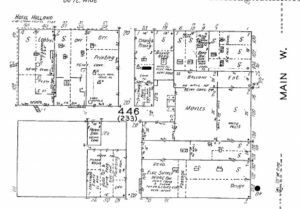 After we were introduced to the Sanborn Fire Insurance Maps, I found myself beginning an exhaustive, online scavenger hunt. 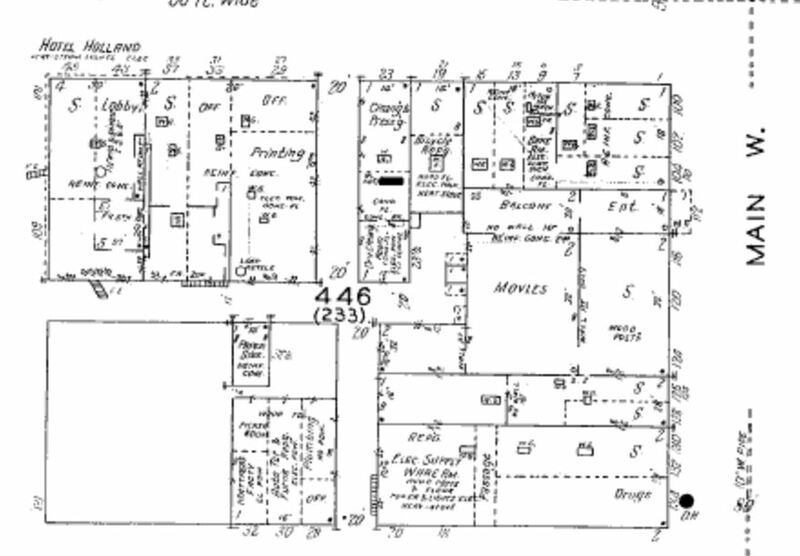 The Sanborn Maps website itself presents numerous challenges in that the website is not very user friendly. For instance, the window in which the map is featured only presents the map in a small square box and provides and zoom-in feature that only zooms in so far that the feature seems almost useless. Additionally, navigating once you are in the zoomed in version is quite complex with the navigation arrows jumping around the map of the town. 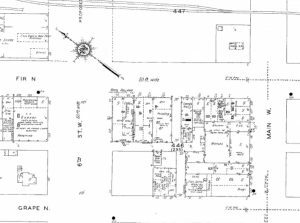 Another struggle with finding theaters within the towns is that the website only provides certain dates for years that the fire insurance maps were published. 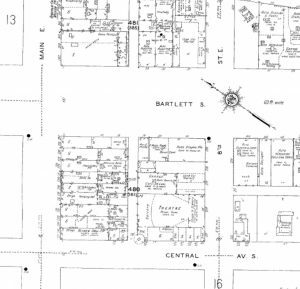 Thankfully, the Sanborn Maps have a set of maps published from 1927, which falls directly in the middle of the time period that I am researching for, 1924-1929. Thus, a victory I’ve had, whereas others are not so lucky, is that Sanborn Maps have provided me with a primary source that I can reference throughout my research. 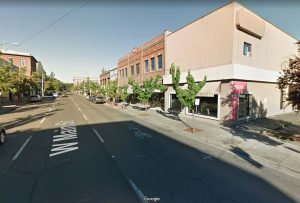 Once beginning my scavenger hunt on the website, I was able to locate two (potential) theaters within Medford, Oregon. Discovering these two theaters was like finding a needle in a haystack. 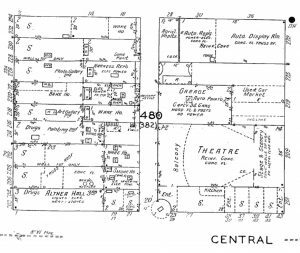 By searching through the Sanborn website, I finally came across these two theaters on separate sheets and each felt like a victory. 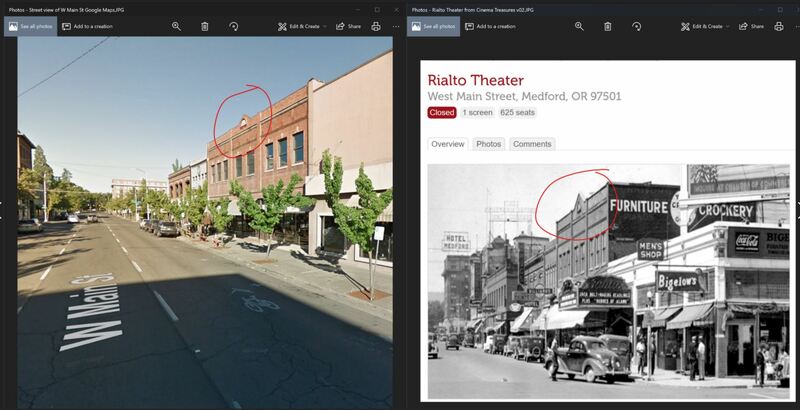 What is interesting is that they are labeled differently with the one on sheet 14 labeled “THEATRE” while the one on sheet 15 is labeled “MOVIES.” Although they are labeled differently, both theaters have a sectioned part labeled “BALCONY” that helped me deduce that these two locations were potential theaters to look into in Medford, Oregon. 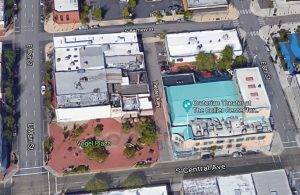 Once locating these potential theaters, I decided to use the Cinema Treasures website in order to try and deduce which theaters these two might be from the listed theaters on the website. 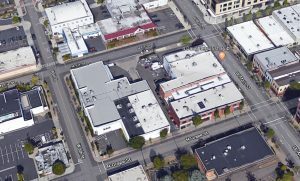 The theater on sheet 14 is located near S. Central Ave and E. Main St. By looking at each theater in Medford on the website, I have been able to determine that the theater on sheet 14 is the Craterian Theater. 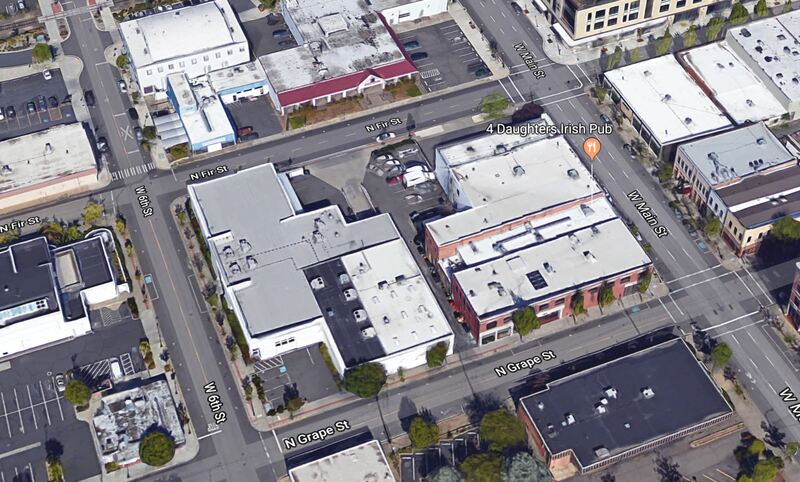 When looking at the photo of the Craterian Theater in an advertisement from the Medford Mail Tribune, we can see the rounded shape of the exterior and entrance of the Craterian Theater which is reflected in the Sanborn Map. 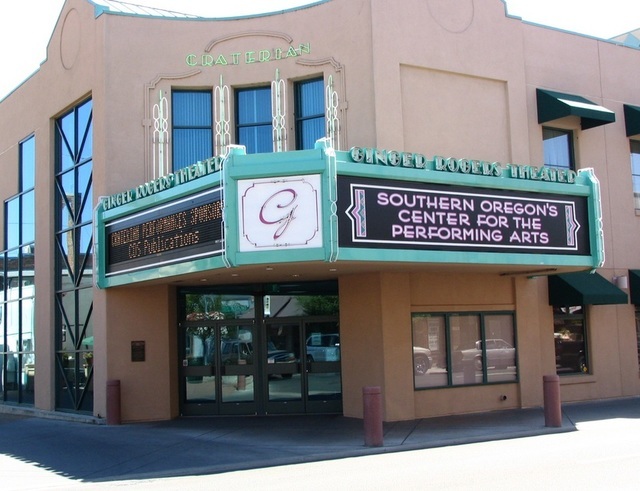 Surprisingly, the Craterian Theater is still open and running today and was renamed to Craterian Theater at The Collier Center for the Performing Arts in 2013 (Cinema Treasures). Being able to identify and locate this theater was a special accomplishment and felt like a personal victory in terms of making a difference when it comes to this project and this class. Similar to the research performed by Ben Singer, “Using every contemporary resource and surviving scrap of evidence a diligent film historian is likely to uncover,” I began my research with the Sanborn Maps and worked my way back from the location on sheet 14 to the list of theaters on the Cinema Treasures website and finally discovered that the Craterian Theater is still operating today (Allen, 76). 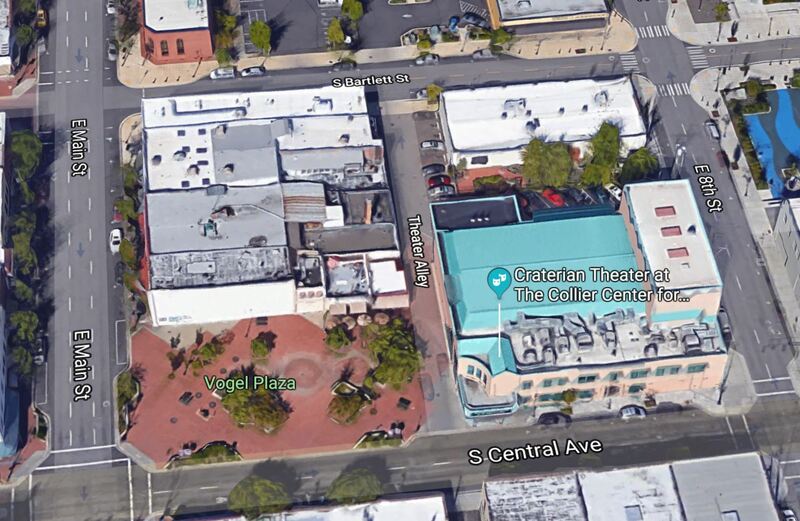 With the other theater that I found on sheet 15, I performed the same search formula; beginning with the streets listed (W. 6th St., W. Main St., Fir St. and Grape St.), I returned to the Cinema Treasures website to locate the potential theater located on these streets. 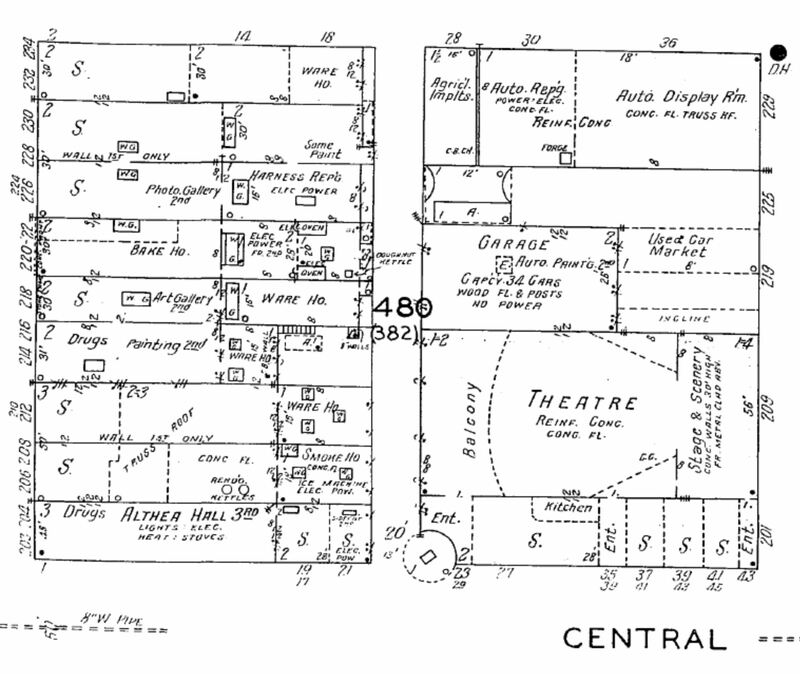 When looking at the map on sheet 15, I noticed that they labeled “Ent.”, which I deduced to meaning ‘entrance.’ By taking this into consideration, we can deduce that the theater’s location and address will likely be listed under W. Main St. Once eliminating the other theaters located on E. Main St. and W. 6th St., I discovered that Rialto Theater was located on W. Main Street. As all historians do, I wanted to double check this theory and decided to fact check. 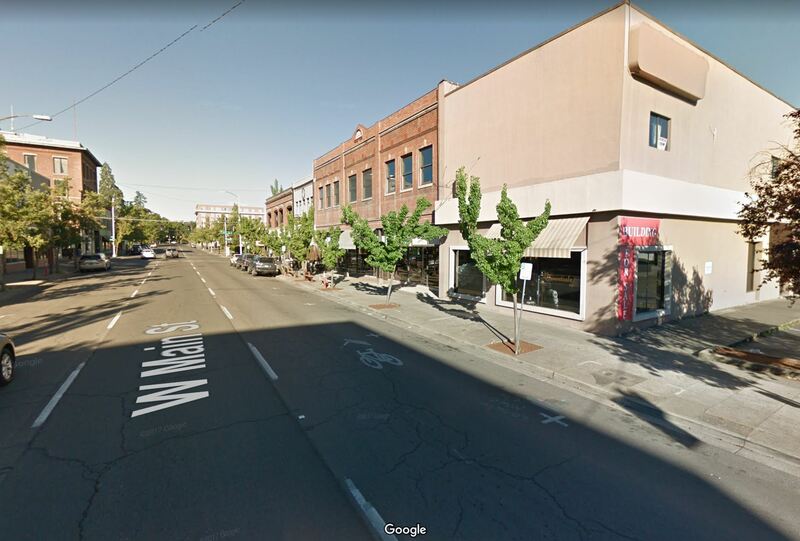 By using Google Maps, I went to the location of sheet 15 in the Street View in Medford, Oregon. Returning once more to the Cinema Treasures website, I looked at the photos provided of the Rialto Theater. 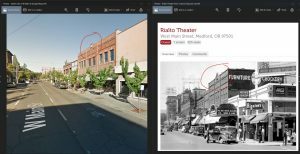 When comparing the photos from the Google Maps Street view and the photos from Cinema Treasures, I noticed the distinct architectural triangle present on the building, referred to as Rialto Theatre on Cinema Treasures website, in both photos. 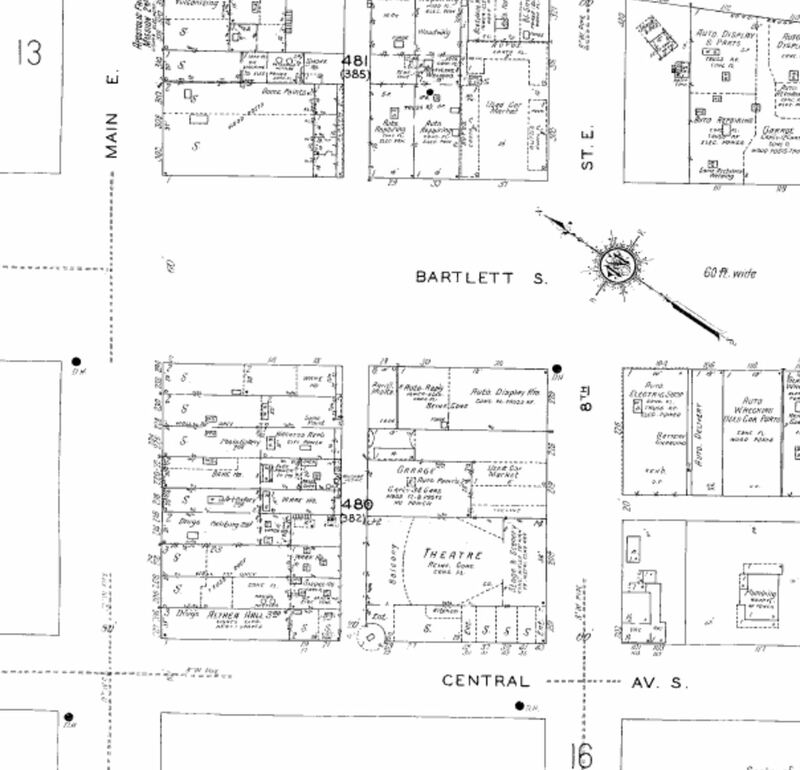 Through this research, I would conclude that this location was the home to the Rialto Theater back in 1927. Allen, Robert C. “Manhattan Myopia; Or, Oh! Iowa! Robert C. Allen on Ben Singer’s ‘Manhattan Nickelodeons: New Data on Audiences and Exhibitors’, ‘Cinema Journal’ 34, No. 3 (Spring 1995).” Cinema Journal, vol. 35, no. 3, 1996, pp. 75–103. JSTOR, JSTOR, www.jstor.org/stable/1225767. “Craterian Theater at The Collier Center for the Performing Arts.” Cinema Treasures, cinematreasures.org/theaters/4427. “Hunt’s Craterian Theatre in Christmas Dress.” Medford Mail Tribune, 1 Jan. 1928, p. 34. “Medford, Oregon (1927).” Digital Sanborn Maps — Splash Page, sanborn.umi.com/or/7405/dateid-000007.htm?CCSI=2197n. 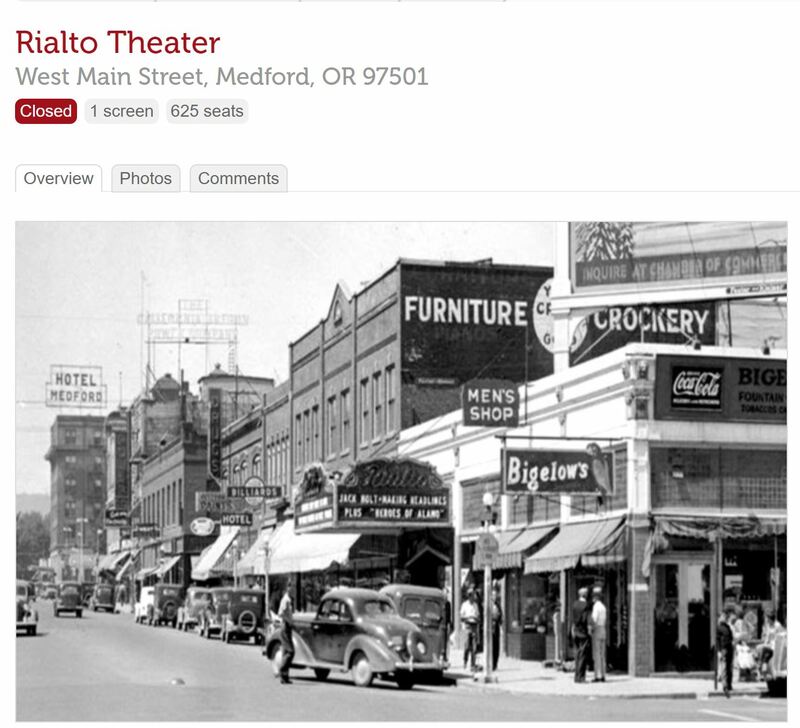 “Rialto Theater.” Cinema Treasures, cinematreasures.org/theaters/36552.